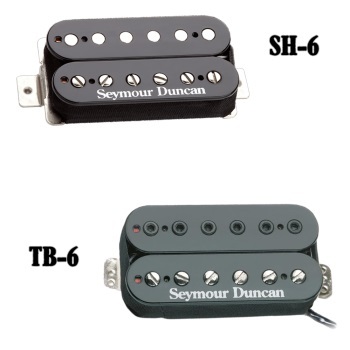 High output humbucker built for aggressive playing styles. Recommended for old school metal, nu-metal, gothic, garage, punk, thrash and other heavy rock styles. Great for drop tunings. Yields high output while retaining clarity. The massive ceramic magnet and hot coil windings deliver tremendous power and raw distorted rock sounds. More aggressive than the SH-5 Duncan Custom. Comes with four-conductor hookup cable. Available for both neck and bridge positions. Often a Distortion bridge is paired with an SH-2n Jazz Model in the neck for good clean tones and versatility. For balanced and warm instruments. Works especially well with rosewood fingerboards. Nickel or gold-plated cover. Trembucker. 7-string version. Colors (humbucker spacing).